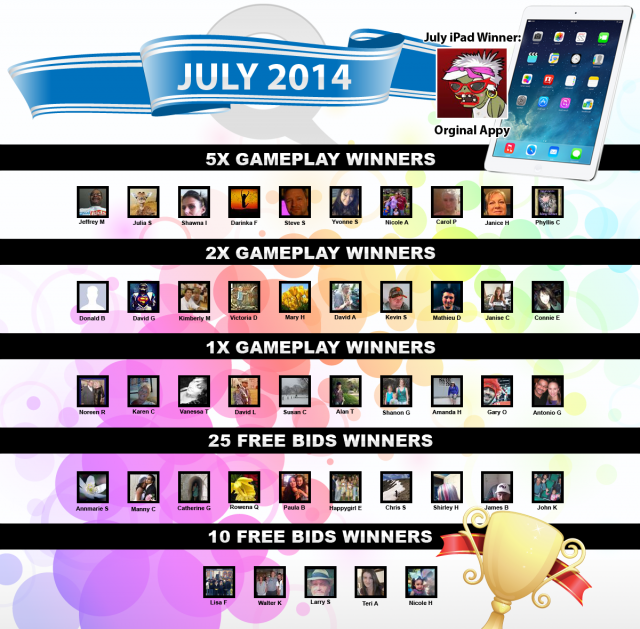 Congratulations to the July 2014 Top QuiBidder winners! Each of these bidders won rewards for their contributions to the QuiBids community on Facebook – and all I can say is that July has been the best month yet!! We’ve spent the past month enjoying your wonderful (and creative) posts sharing the love of QuiBids. And we even saw a more giving side of the community that made our collective heart swell. If you want proof that there is still good people in this world, look no farther than our Facebook page. You all are truly something else! Do you want to join the Top QuiBidders Leaderboard and earn points so you can improve your chances of winning rewards like the bidders pictured above? Go here to find out how. Congrats again Appy! Hope you enjoy your new iPad! We had so many good posts last month that it’s hard to say that with certainty that one particular post is better than any of the others. They were all so good, in fact, that we decided to give a 1X Gameplay to the honorable mentions. Those are listed below. Post by Connie Crawford Ehlmann. Post by Victoria Mauldin Dean. Thank you to all who participated in the July Leaderboard last month! Let’s make August even better! Winners: It could take up to 14 days to receive your rewards. It shouldn’t take that long, but if does take any longer than that, contact support.